Eric - for sale or rent! He loves to cook and eat Low Country Boil. He's always looking for an excuse to whip up one of these pots of shrimp, sausage, potatoes, and corn. So, when his co-workers were considering a Low Country Boil for their rehearsal dinner, Eric immediately volunteered his services. He cooked for a group of about fifty people and, even though I wasn't there for the event, he assured me it was a success. So successful, in fact, that he wanted to share his cooking methods with my blog readers. Again, this is more of a process than a recipe. So, I'll show you the process that Eric goes through to prepare this dish. This afternoon, we cooked about five pounds of shrimp. This is what we usually cook for our family of four because we like leftovers. Our general rule is one pound of shrimp per person - of course, most kids don't eat a pound of shrimp so plan accordingly. This is two one-pound Kielbasas cut into bite-sized pieces. 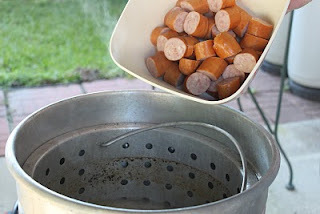 We always use Kielbasa...always! The sausages make all the difference. 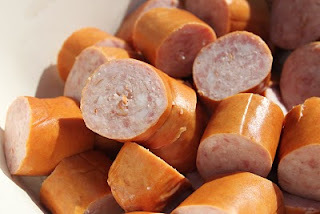 I know that other people use beef sausages or just generic smoked sausage but I wouldn't want to eat it. Trust me on this one - get Kielbasa! This is about two pounds of red potatoes. Since these were pretty large, I did cut them up into pieces. Preferably, we like to use small new potatoes that can remain whole in the boil. But, I can't control the grocery stores inventory so we had to make do with what they had. We use one crab boil bag per five pounds of shrimp. Also, Eric will not cook a Low Country Boil without lemons. We used three for this pot. We also added some corn-on-the-cob. 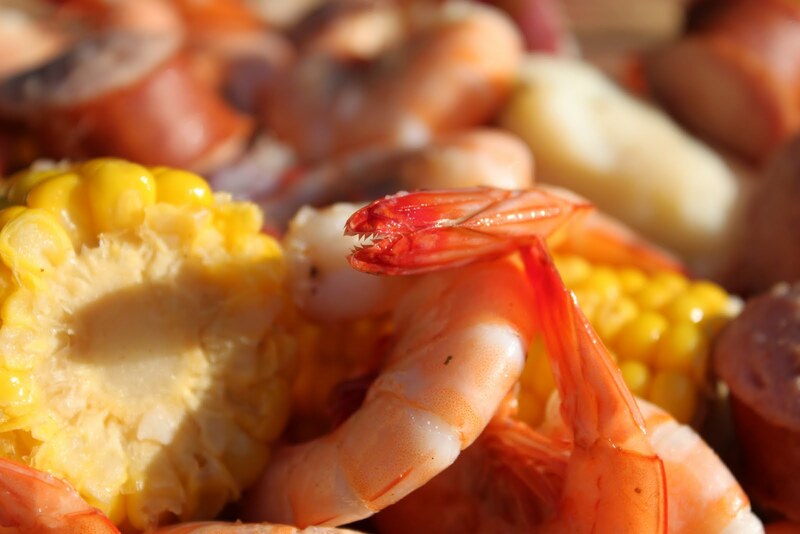 One of my favorite Low Country Boil disaster stories is one that Eric experienced. 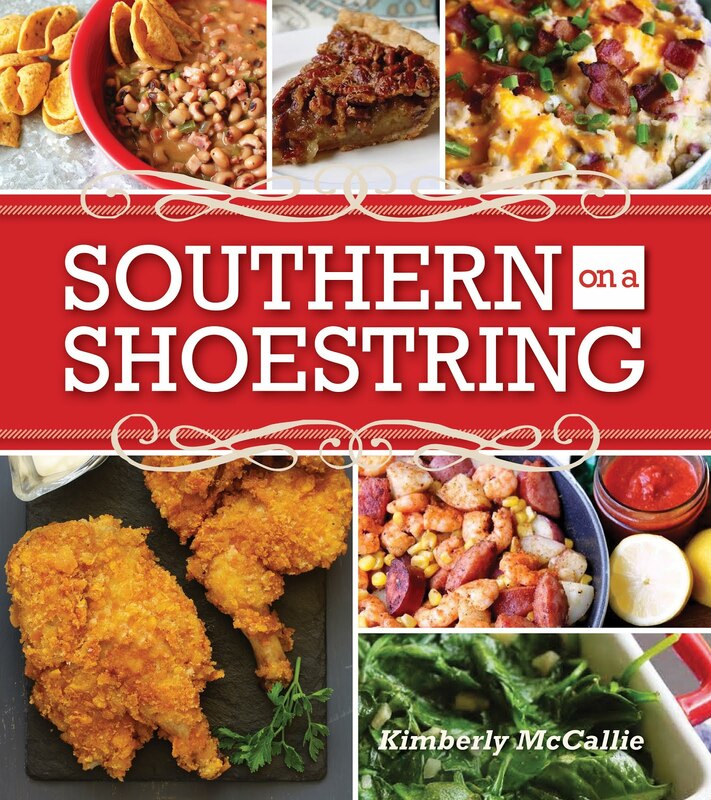 He was invited to a Low Country Boil years ago and it was the host's first time making the dish. The man threw the shrimp in the pot and they cooked and cooked and cooked. Eric overheard the man say that he was told to cook the shrimp for 30 minutes. When I asked Eric why he didn't say anything, he said, "I didn't know the man; it wasn't my party." So, needless to say, I'm sure the shrimp were like rubber bands after a half hour in boiling water. Good luck getting the shells off those things. Here's Eric's pot. 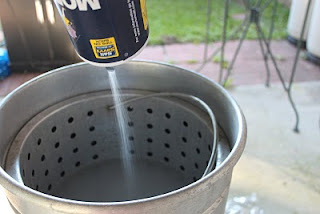 First tip - Don't fill the pot with water from the garden hose. Get the water from the kitchen sink. 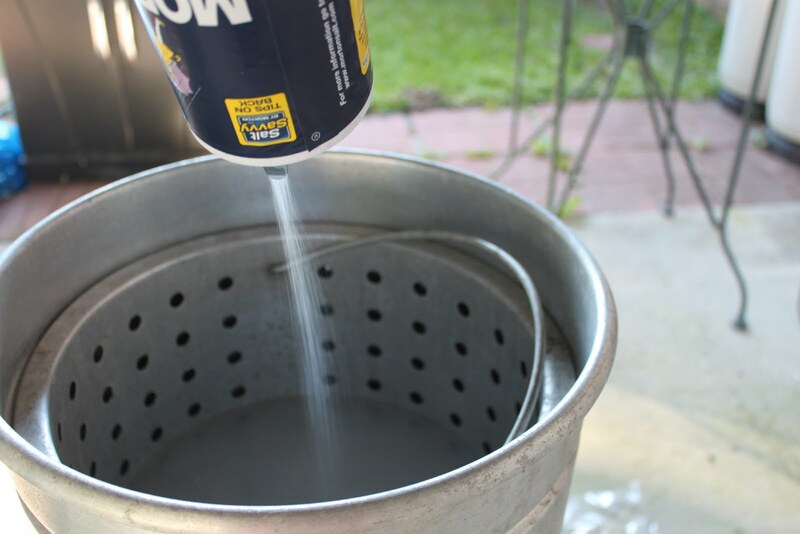 When you're filling the pot, keep in mind that the water level will go up as you put in the food. 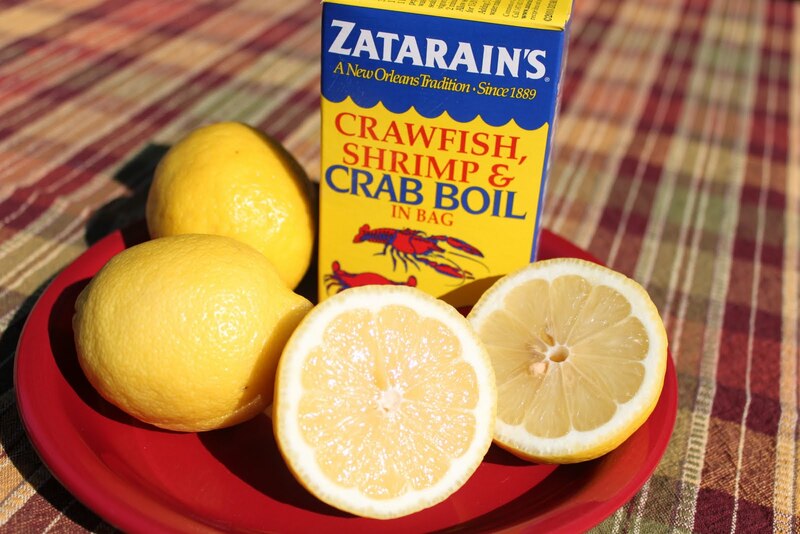 After you've filled your pot with water, throw in the bag of crab boil and, this is not a typo, add a whole container of salt. 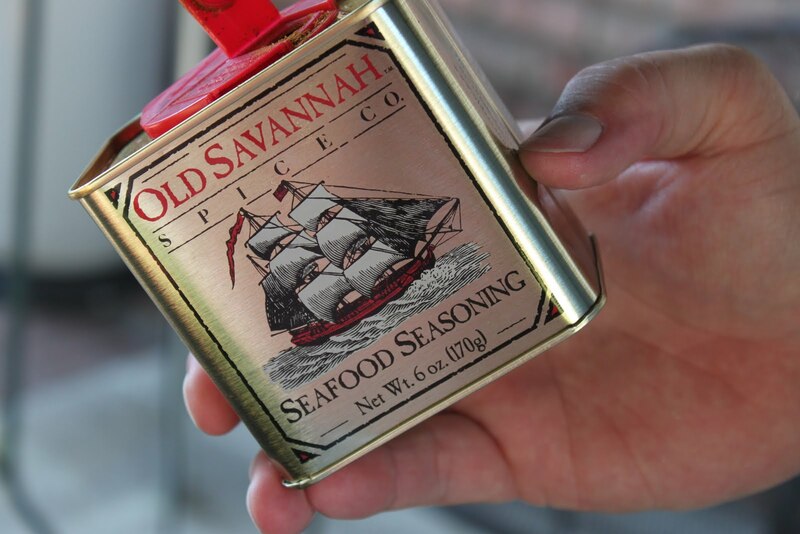 In addition to the crab boil and salt, Eric also likes to add some seafood seasoning. He uses 2 tbsp. per five pounds of shrimp. After adding all of the seasonings, put on the lid and bring the water to a vigorous boil. 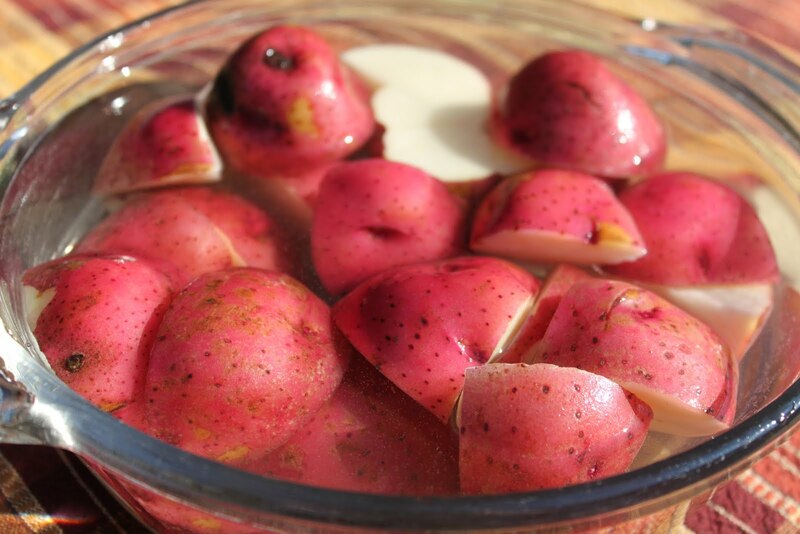 Once the pot has reached a boil, add the potatoes and squeeze in one of the lemons that's been cut in half. Cook for 15 minutes. The next step is to add the sausages. Squeeze in two more lemons and add a whole onion. Cook for 10-15 minutes or until the sausages start to get plump. Next, add the corn-on-the-cob (of which there is no photo) and let cook for approximately five minutes. The next step is the most important one - adding the shrimp. Once you add the shrimp to the pot, stir the shrimp for approximately one minute. After one minute, turn off the fire and cook until the shrimp are done, approximately four minutes. Do not cook for more than five minutes!!! We usually take out a shrimp at the four-minute mark and test for doneness. When the shrimp are done, remove the food from the pot. 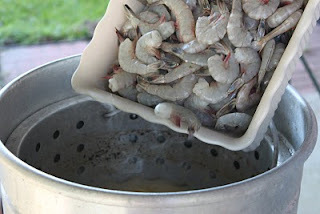 Under no circumstances are you to leave the shrimp in the pot and let them soak unless you want the shells to seal around the shrimp. Please!!! Ah, there's the corn. I knew you were in there somewhere. 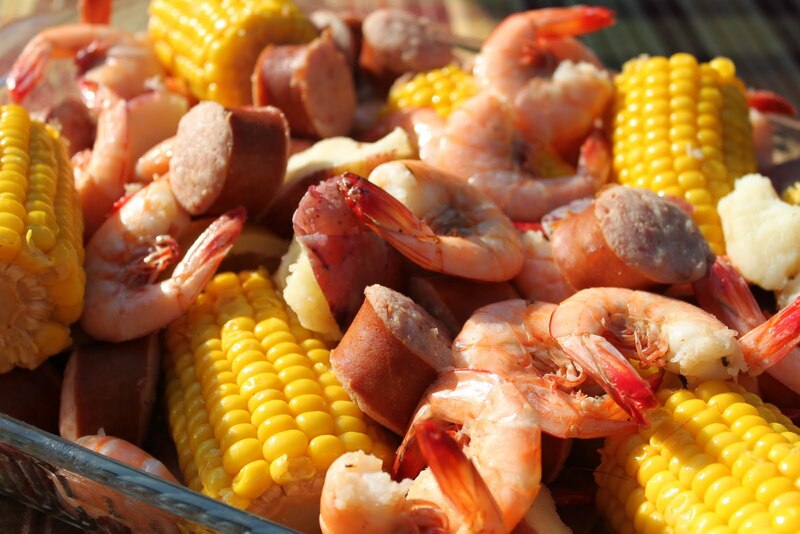 Low Country Boil! Serve with Eric's cocktail sauce and enjoy! I love the commentary on there is the corn. Great receipe and directions. My husband likes a Low Country Boil that is pretty hot with spices and seasonings, is the Zatarain's spicy hot or just flavorful? No, the seasoning isn't spicy. It just adds flavor. Why a whole container of salt? It actually takes a whole container of salt to season the low country boil because it is such a large volumne of food. The potatoes absorb a lot of salt by themselves. But, you want the corn and shrimp to be salted, too. But, even with the container of salt, it isn't overly salty. I find it very difficult to salt food after it's been cooked so we salt as we cook. Thanks! If we were to add crab legs to the boil, at what point do you think we should start cooking and for how long? The crab legs need to cook a little longer than the shrimp so will need to go in before the shrimp. If you're using frozen, pre-cooked legs, put them in the boiling mixture and allow it to come back up to a boil. This will take a few minutes. Once the water is boiling again, add the shrimp and cook as directed. In general, crab can soak in the cooking liquid but shrimp can't. 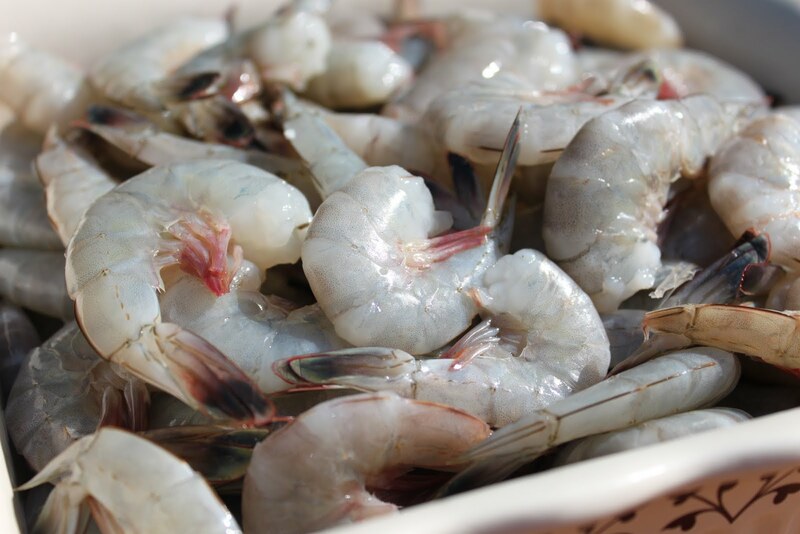 The shrimp have to be removed immediately as soon as they are done. How much corn do you use? We usually use a pack of 12 small ears of frozen corn. It's really according to how much corn you think will be consumed. Many times, we haven't used corn at all. But, if the kids are eating it, we will add corn. We want to add live lobsters....what step and for how long? Thank you! You would need to let them cook, depending on size, at least ten minutes before adding shrimp. See the post I added above for details.